Poach the prawns:Bring a pot of water to boil. Add the prawns. Cook for 3-5 minutes until pink and opaque. Drain and place in a bowl of ice water to cool. When cooled, pat dry and cut into bite-sized pieces. 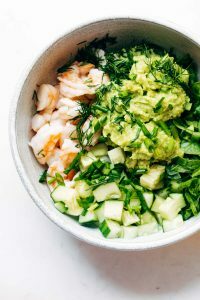 Assemble: Toss prawns, avocado mix, cucumber, and herbs together. Season to taste. Eat on the deck in the summer with a cold coconut water.